Just weeks ago, Visual Capitalist showed you a colorful visualization that breaks down the $80 trillion global economy. 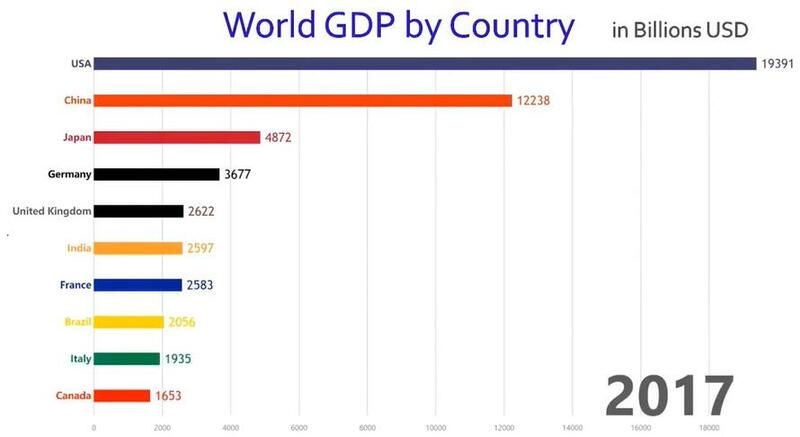 While such a view provides useful context on the relative size of national economies, it’s also a static snapshot that doesn’t show any movement over time. In other words, we can see the size of any given economy today, but not how it got there. 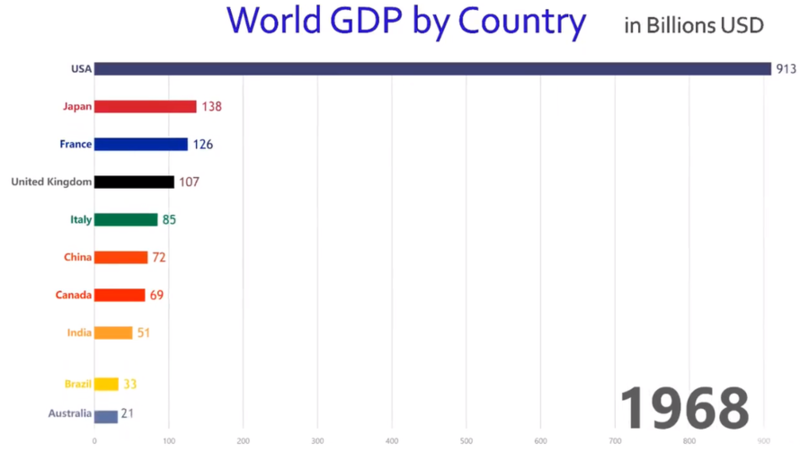 As Visual Capitalist's Jeff Desjardins notes, today’s animation comes to us from Jaime Albella and it charts how GDP has changed over the last 57 years for the world’s 10 largest economies. It provides us with a lens through time, that helps show the rapid ascent of certain countries and the stagnation of others – and while there are many noteworthy changes that occur in the animation, the two most noticeable ones have been described as “economic miracles”. You may have heard of the “Japanese economic miracle”, a term that is used to describe the record-setting GDP growth in Japan between the end of World War II and the end of the Cold War. Well, the above animation shows this event better than pretty much anything else. In 1960, Japan had an economy that was only 10% of the size of the United States. But in just a decade, Japan would see sustained real GDP growth – often in the double digits each year – that allowed the country to rocket past both the United Kingdom and France to become the world’s second-largest economy. It would hold this title consecutively between 1972 and 2010, until it was supplanted by another Asian economic miracle. The other rapid ascent in this animation that can be obviously seen is that of China. Despite falling off the top 10 list completely by 1980, new economic reforms in the 1980s and 1990s helped pave the way to the massive economy in China we know today, including the lifting of hundreds of millions of people out of extreme poverty. By 1993, China was once again one of the world’s largest economies, just squeezing onto the above list. By 2010 – just 17 years later – the country had surpassed titans like the United Kingdom, Germany, France, and even Japan to secure the second spot on the list, which it continues to hold today in nominal terms.